Who is the Siemens-Betriebskrankenkasse (SBK)? 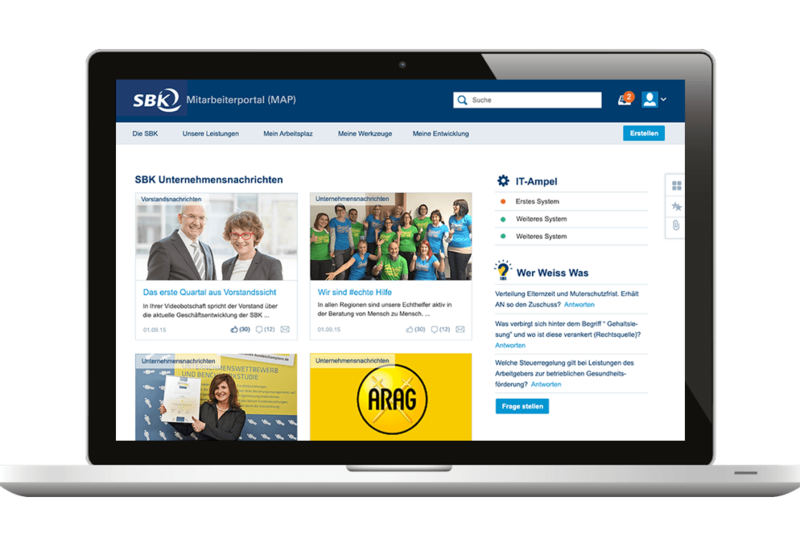 The SBK is one of the largest health insurance providers for companies in Germany and one of the 20 largest national health insurance providers. More than one million insured customers rely on its expert advice, multi-award winning customer service, and excellent benefits. SBK has been offering their services since 1908. The name “SBK” was registered in 1950. The insurance provider has 104 branches across Germany. SBK was already using Confluence. The idea of the new Linchpin intranet was to support the company in its planned cultural change. It was necessary to define steps that would improve collaboration, aside from the technical relaunch of the intranet. The focus was on promoting an open working culture and thus improving the ease-of-use of the system and minimizing the effort that users needed to spend to communicate with each other. Another requirement was the standardization of the system in order to work with current versions quicker and to use new features. Custom design: This intranet is equipped with a custom Confluence theme based on the corporate design of the company, and thus feels familiar to the employees. Additionally, various improvements were made in the usability and functionality of the standard Confluence interface, making the intranet as a work tool easy to use. Personalized app center: From every webpage, employees can directly access all of the important applications and tools that are relevant to them in everyday work. The system is thus the central cockpit for the employees’ daily tasks. Extended user profiles: The extension of user profiles allows users to search for experts. Employees can find each other more easily, connect with each other, and if necessary, find specialists to further help them with their projects. News channels: Company-related news on the employees’ homepages can be personalized to their roles and locations. Users can create their own customized news feeds from different news channels within the intranet – such as IT support, the employee blogs, etc. – to automatically provide themselves with a feed of interesting information and to stay up-to-date. News can be shared both by location or globally within the company. Project implementation process: To tailor the suite to meet requirements, user-story workshops were carried out at the beginning of the project. Agile methods, iterative implementation and improvements as well as quick realization of the complete project led to the desired results.